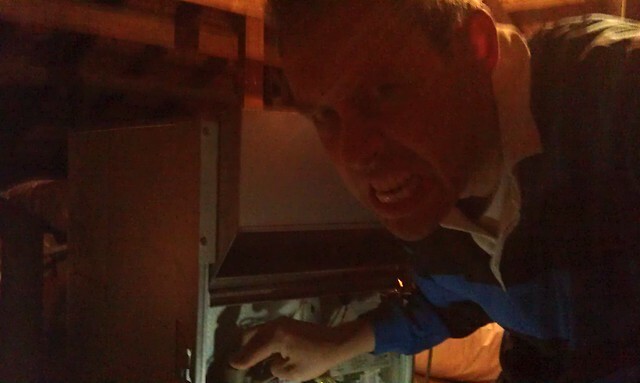 As you can see, I just love getting up in the roof and having to try and get the heater working. Not that it happens often, but yesterday the heater stopped going. Following the relighting instructions, the pilot will light, but after waiting the specified minute to switch it to full On mode, goes out again. Waking this morning, the house had cooled to 11 degrees overnight. Some people on the Interwebs with this problem suggested trying again after it’d been off for a few hours, but doing so this morning was not successful. So I’ll be calling in the service people. The heater is the wonderfully named Brivis Wombat 92. I assume that means it’s a 1992 model, probably installed in the house when it was renovated around 1995. Hopefully it’s just a minor issue for a service person to get it going again. Would rather not be without it for too long. Update: via Service Central (a suggestion from Kev on Twitter) I found a repair bloke who could come out today. They replaced the injector and the thermo-whatsit, and the beast works again. Total cost including parts about $320 – which sounds like a lot, but apparently it would have cost even more to call out Brivis to do it. Our central heating is a Brivis, circa 1970s, and (touch wood) has never broken down. I think the pilot light’s gone out twice in the past 20 years – the unit is in the garage thankfully. @Roger – what are your energy bills like though? Its my understanding there was no energy labelling or basic efficiency standards until the 1980s, so I’m guessing your unit it a lot less efficient than newer models. Probably the thermocouple has gone bad. This is the small flame sensing rod in the pilot flame that shuts off the gas if the pilot gets blown out and prevents the escape of unburnt pilot gas as well as prevents the main burner from coming on without an ignition source. It works by generating a weak electric currant from the heat of the pilot flame and this currant “holds” the gas supply open with a small electronagnetic coil. If there is no currant being generated a small spring will close the gas supply to both tne pilot and the main burner. It should be a simple fix with a cheap part. A newer furnace will most likely have an electric spark or hot surface ignitor instead of a pilot. An older furnace like the one you have will not be as efficient as a new one made today however the payback in fuel savings by buying a new furnace may not be quick enough to justify replacing it now. You burn a cubic metre of gas, you get X kJ of heat. For a gas heater, efficiency doesn’t really come into it. @enno – yes you burn a cubic metre of gas, you get X kJ of heat, but how much of that is transferred into the air/water/etc that then goes into your house and how much is vented out? You look quite attractive when cross, lol. @enno – So I guess I can just leave the stove going to heat the house then? Why have gas hot water systems become so much more efficient? The size of the furnace will result in a different gas to oxygen ratio, and therefore a different temperature for a given amount of gas. The insulation of the furnace and ducts will change how much heat is lost before entering the house. The mechanism for transferring the heat from the gas to the air pumped through the house will vary in efficiency. Here’s some info from the folks that run the Energy Rating system. @enno – as others have said, the conversion of the gas to energy is always perfect – it’s getting it into the house that’s the tricky bit, and we’ve gotten better at that. Interestingly, the newest (as in most efficient) reverse-cycle aircon units can actually be cheaper to use than a gas heater. And without paying a daily connection charge it can be better again, but a lot of people will still want gas for cooking. Some boffins need to do a comparison: reverse cycle Air Con versus Natural Gas heating. Reverse Cycle AC is incredibly cost effective, but is it cheaper than Natural Gas Heating? you sound like a gas appliance marketing person! No seriously, that is a good question. I don’t know the “efficiency” of my current unit so it’s hard to compare with something else. Often, the more stars the more energy the appliance uses – but it produces more output (which might just disipate anyway). You should stick to subjects you actually know something about, before giving a lecture. The arrangement of the burner is going to control the gas to oxygen ratio, not the size of the furnace. The only way you will get less heat ( not “temperature” ), from the combustion of gas, is by depriving the flame of sufficient oxygen, so that some proportion of the gas is not burned at all. So what you are suggesting, is venting some of the gas, un-burned, into the atmosphere. That is silly on cost grounds and also emits methane, a greenhouse gas. Not smart. Not to mention carbon monoxide. All gas heating furnaces, even “less efficient” ones, operate on a substantial surplus to air, to avoid this happening. And this does not depend on either the age or the size of the furnace. For small gas heating appliances which are not externally vented, you get all the heat from the gas, regardless of the age or sophistication of the appliance. For appliances where the combustion gases are vented externally, the key factor is the efficiency with which the combustion heat is transfered from the combustion gases to the interior air. This also has nothing to do with the size of the furnace nor with the air-fuel ratio of the burner. It is wholly dependent on the effectiveness of the heat exchanger design. Enno is correct. The very newest furnaces (hot air heat) and boilers (hot water and steam heat) are so efficient at reclaiming the last bits of heat from the flue gases before they are vented outside (95+% efficient) that the moisture contained in the flue gas actually condenses giving up it’s latent heat and the furnace or boiler needs a drain line to drain it away. Furnaces and boilers from the early 80’s and before (at least in the US, I’m not sure about Australian ones) were often only 65% or less efficient at getting the heat into the house or building with the remaining 40% or so going right up the chimney/vent/flue and this excess vented heat was paid for with the fuel bill. Unvented gas/kerosene heaters as well as gas stove burners and ovens used for heating (both new or old) are indeed 100% efficient as all of the heat is released indoors heating the home or building but this also uses up the oxygen in the space and releases carbon dioxide into the space and water vapor too. As the oxygen gets further depleated the flame is starved for oxygen (as are the living occupants in the space) and carbon monoxide begins to be formed. This is deadly and the reason heating appliances are vented and unflued heaters should be used with a window open or in a large space. @enno – You’re right. The physics of the matter isn’t my strong point and I shouldn’t have pretended they were. We’re all guilty of harping on about topics we don’t really understand though aren’t we enno? However, by your own admissions, there is more to it than simply “gas burnt = heat generated @ 100% efficiency”. Heat transferring, heat losses, etc will always factor into it. If this wasn’t the case, why would there be any energy labelling scheme for gas appliances at all?